The subscribers list is one of the core elements when it comes to Marketing campaign practice and its decisions. Despite its well-known significance recognised by businesses across the globe, there are still several concerns frequently confronted by marketers. How do I build a subscribers list? Is my subscribers list on the rise? How rapidly are addresses being added? How can I grow my subscribers list quicker? Why don’t all my customers provide me their e-mail addresses? Once you are into the process the solutions for all these questions can be found because there have been several proven stories in this favour. By applying the approaches that fit for your business and target audience, you will start to shape the sort of list that the most sense for your business intentions. 1. People will only give their email addresses to organisations or individuals they trust. 2. If you don’t get permission and respect it, your list will stop rising. As you understood the principles, building a trust with the customers is highly essential in order build a subscribers list because they both are connected in a manner in which you cannot see them separately. The fact of the matter is the subscribers always want to know more about what the organisation is offering and whether or not that can be beneficial for them. They often anticipate to get be kept informed on what they are interested in and what are new in the market or field they have selected. If your business had these sorts of customers you would definitely be so lucky because you only get these sorts of customers in which trust is existed. It is a very well-known fact that whenever your customers trust you they will reward you with their loyalty. Now it is your responsibility to maintain the trust and protect their privacy. Many serious online business people have already recognised the importance and the impact of trust in building relationship. On the other hand, substantial quantities of internet users have gone to great extents in guarding their email accounts and addresses from spammers. So, you can merely build the subscribers list and then relationship through trust. When you have solid opt-in mail list and subscribers information, the information (i.e. newsletters, offers, catalogues, special rebates etc.,) you send through mails will be received by your audiences in an optimistic manner. You at this stage should learn to keep maintaining good relations with the customers. If you expect an opt-in list to continue using your products or services, you again need to keep trying to build the trust with new Learning methods. For a faster and quicker build up, you definitely require to get your opt-in subscribers to trust you quickly. The faster you build your opt-in list the faster word about your business and company gets to be spread. The greater the scope of your opt-in list the more traffic you receive meaning more profits. It may seem stress-free; however it needs a systematic yet constructive understanding and then implementation for a fruitful result. Here in the following sections, we are going to present you the most effective actions that help you to get your opt-in subscribers to trust your products and service quickly. In a case where you have a legitimate business, receiving the trust of your customers should not be that unbreakable. However, getting your customers trust is based upon your capability and service. People often rely on other people who know what they are talking about and they gather all the facts and information about your business and its products and services. Therefore, it is a great idea if you decide to go into a business you have interest in. When you have a command on your products or services you then can make things easier to convince your customers. You have to demonstrate your clients that you know what exactly you are saying about. You make sure that you are providing them with helpful suggestions and guidelines that relate to what you are trading or selling. For example, if you are teaching a module online, talk about your teaching styles and methods you use to make people understand better and gain good results. 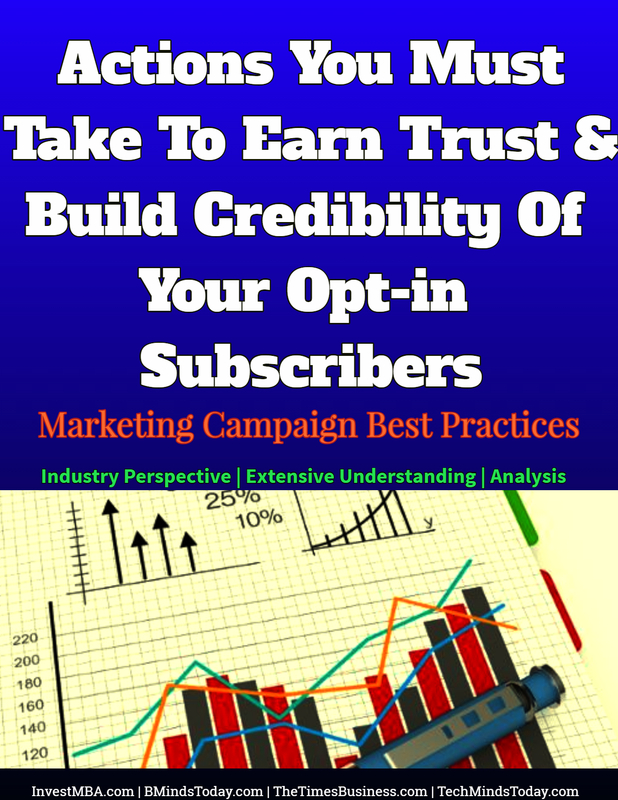 You don’t have to be a large company to make use of an opt-in subscribers list. If your customers understand you as somebody who knows what he is doing and saying, they will trust you quickly. It is always very important to believe in your own product and capability. If you are good at this, you then can be true to your customers. You then can provide a guarantee because it may give your product or service hype in the market. The more happy customers or clienteles you get, the superior probability there is that they will applaud you and recommend your products or services to others in their vicinity. In general, people will trust someone they know. When that someone applauds you and recommends your products or services, you then can expect decent sales because they will go to your shop or website and check it for products or services they want to buy. This is one of the most important approaches to build a solid trust with your customers. You repeatedly have to try to prove them that you are not there to trap them, but then again you are there because you want to help them in choosing products or services they seek. You also have to make sure that you are keeping a clean list that would enable them to unsubscribe anytime they wish. To make this process easier, you can elaborate your web form by providing info on how to unsubscribe from the list. You simply have to guarantee them that they can let go of the service whenever they want to. You at this stage can come up with brand new offers for such customers so that they may change decision and prefer to stay. You should always learn to apply the innovative methods according to the scenario and the requirement. You have to keep recalling that when business gets the trust of customers or clients, that has to be remained.